Variable capacitors are used to tune your radio, and sometimes to fine-tune RF circuits and the accuracy of the frequency dial indicators. They consist of a set of non-movable, or static plates called the stator and a set of moveable rotor plates connected to the shaft. 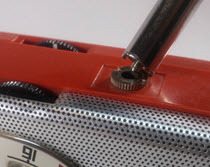 The shaft either connects directly to a tuning knob, or to a Rube Goldberg assortment of strings and pulleys and whatnots. 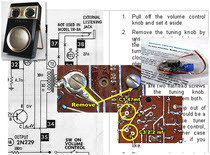 Learn more about dial string mechanisms here. 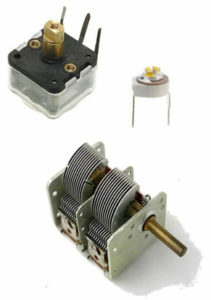 The photos show a typical tuning capacitor for a pocket radio (top), a “trimmer” capacitor in the middle of the illustration used to adjust oscillator circuits and tracking, and a large capacitor found in early, large sets. This one has two separate rotors. These are called ganged rotors.